Starting The Week Off... with a sweet blog link up! 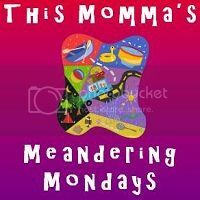 I am so very happy to be co-hosting this weeks "This Momma's Meandering Mondays" gathering from This Momma's Rambling herself, Stacey Gannett. I have found kind, informative, funny and supportive bloggers through this blog link up and I'm excited to share it with you. Link up your blog and use this list as your "Must Read" for the week. Enjoy! Well hello to everyone out there and a happy Monday to you all...and you know what Monday means...This Momma's Meandering Mondays #6! Some come on in, meet some amazing folks, find some awesome and tasty treats, and best of all make some friends and grow together! This month, I will be asking my lovely co-hosts to pick their favorite post from those linked up each week to showcase them as "This Momma's Marvelous Meanderers", so be sure to check back next Monday so see if you have been featured! And, don't forget to enter the amazing group giveaway! Okay, are you ready to party?!? Well then, without further ado...let me introduce you to my amazing co-host's for August! ~ "Indigo Girls, Elephants and Otters Oh My!" ~ "Church Is Not The Place To Have A Wardrobe Malfunction"